Our goal is to expand overall bike ridership by helping to eliminate the Number 1 threat to cycling fun ... a flat tire. California Bike Gear introduced STOP Flats2 tire liners just prior to the 2007 Interbike Show. In that short time, they have quickly become the industry standard due to innovative sizes, improved packaging, and a lifetime guarantee. 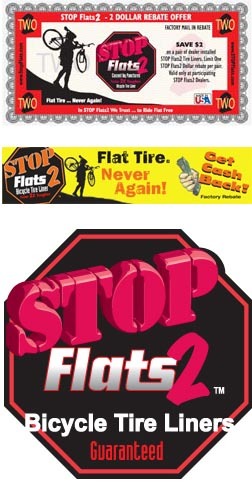 From the world's most experienced tire liner manufacturer ... over 25 years of puncture prevention now with a new brand name ... STOP Flats2. California Bike Gear is the new umbrella name for all products manufactured by Cal Springs, LLC, including Stop Flats Tire Liners, California Springs Water Bottles, and, of course, Quik-Stik Tire Changing Tools. The new website at CaliforniaBikeGear.com provides a consumer section where bicyclists can learn all about these product lines. There is also a password protected, dealer area where dealers can get ideas on how to sell more of these products. New to the website is a place for dealers to create custom art for imprinted water bottles.